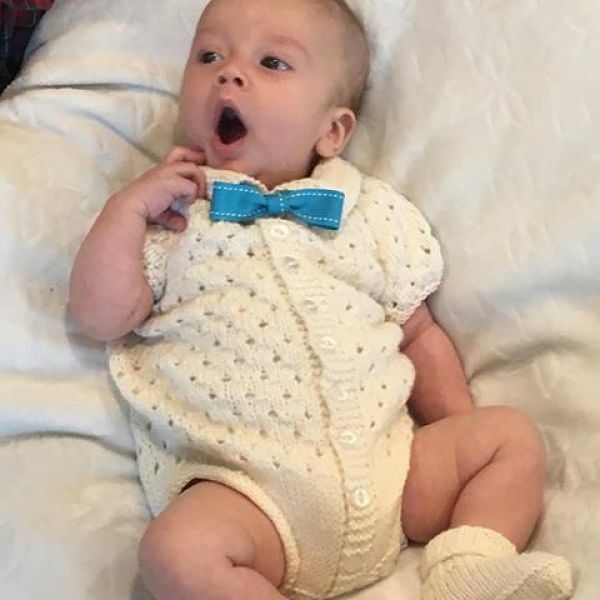 This cute little button up vest was made by Sandra in Canada. We think its looks lovely, and love the pastel shade its been made in. Thank you for letting us share your photo Sandra. 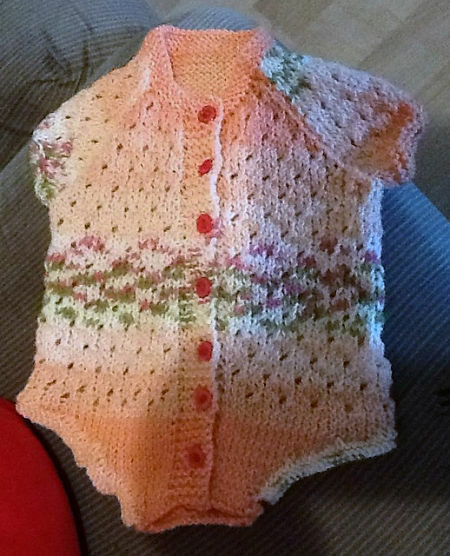 This lovely little button up vest has been made from knitting pattern no. 12. It also won Kim from New York, first place at a craft fair! I think it was a well deserved win and I hope you will all join me in saying well done Kim! 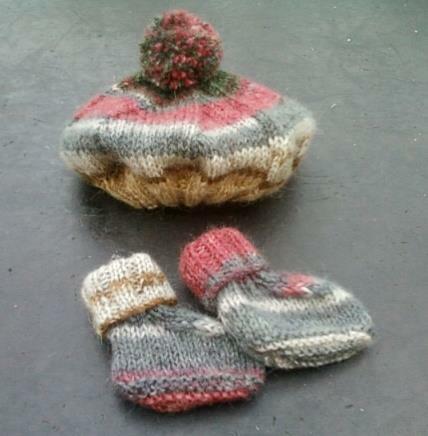 This little tam 0 shanter has been knitted by Shirley. She has amended my pattern slightly by changing the moss stitch for stocking stitch and doing it in a self patterning yarn and we think it looks just great, and we love the colours. Thank you Shirl for letting us share your picture. 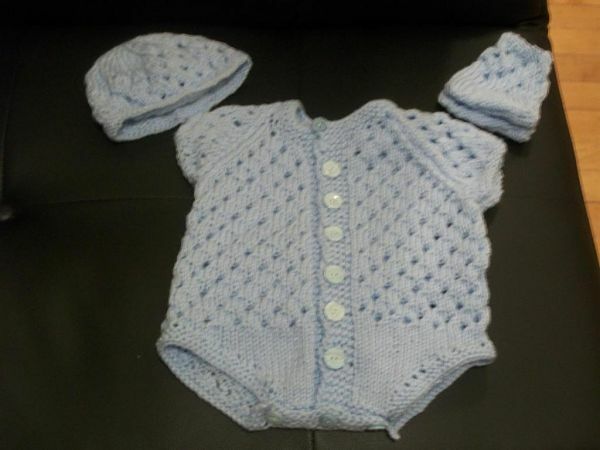 Here's a photo from Annette of Nettie's Reborn Creations of the premature button up vest set. 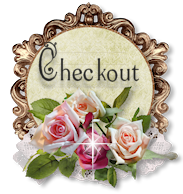 We think it looks great in green and we absolutely love the flower she attached. Thank you Annette for letting us share your work. Another photo from Joan, hasn't she been busy? 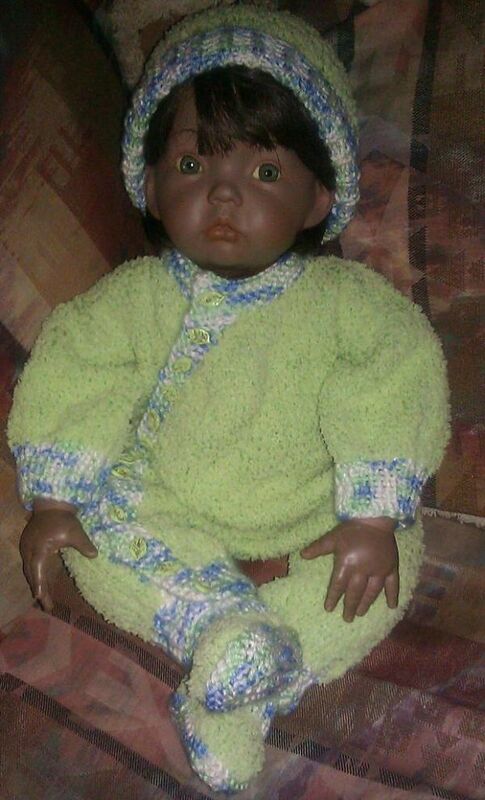 This is her outfit from knitting pattern 27. Thank you for letting me show your photo Joan, we think its another great outfit you've made. Photo sent in from Joan. She has made this little set for her lovely 10" doll. She adapted the premature boys matinee set by using 4ply yarn instead of double knitting to get this good fit. I love it! Thank you Joan for letting me share your work. Photo sent in from Raquel. She has made this porcelain doll herself, knitted the side buttoning romper and made the little leaf buttons on it herself! Thank you Raquel for allowing me to share your work, it all looks absolutely beautiful. 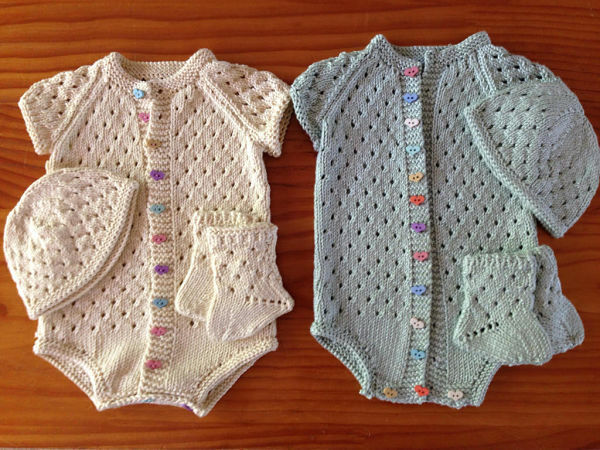 Sophie has knitted both of these vest sets for twins that are due. She has used a cotton/silk blend yarn. I think they have knitted up really well, and look fantastic with the multi coloured mix of heart shaped buttons. Thank you Sophie for letting me use your picture. Sonia has knitted my vest pattern for a special occassion, and I must say, she has done a beautiful job! It looks so cute on, especially on such a handsome model. Thank you Sonia for letting me share your photo.